Bring passionate fire and wild fun in to your life and garden with our new 45" Fiery Sun Bali Garden Stake. These incredibly high-quality Bali Garden decorations feature extraordinary, cheerful and colorful designs which are made exclusively by hand. 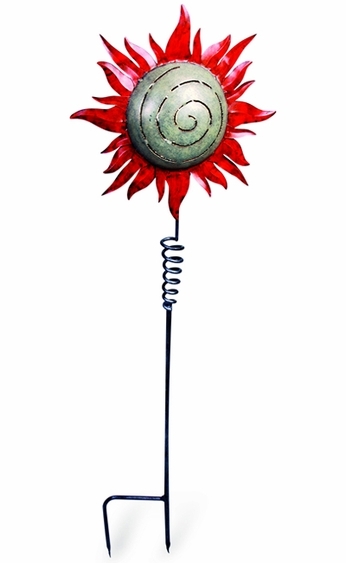 Made from sheets of steel, welded, buffed, sealed, varnished and then painted, this Bali Garden metal sun garden stake is as strong and sturdy as it is beautiful. A strong H-Stake bottom stake design helps provide extra ground stability. In addition, an inner compartment inside the top allows this metal sun to be lit up from the inside with a tea light candle or a string of LED lights! This added flair can create a magical glow of evening enchantment on the terrace or in the garden. An absolutely beautiful piece of unique garden art!